Nothing beats the convenience of quick and easy sheet pan meals! 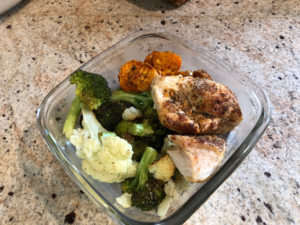 During meal prep Sunday or Monday, I love getting creative in the kitchen, so that I am not stuck eating the same meal 5 days in a row. However, life can catch up to us, and cooking two or more different recipes and washing endless dishes cannot fit into our busy schedule. 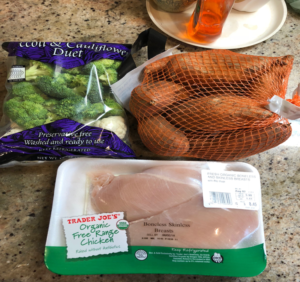 Scheduling in our meal prep is extremely important especially when we are working towards a specific goal, so skipping meal prep isn’t always an option. Luckily, sheet pan meals are perfect for when we are short on time! 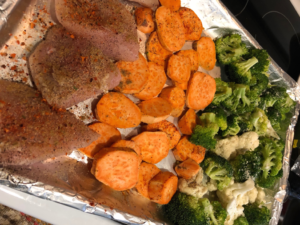 Time is something we all wished we had more of and sheet pan meals definitely allows us to cook while getting a chance to enjoy quality time with loved ones and relax. 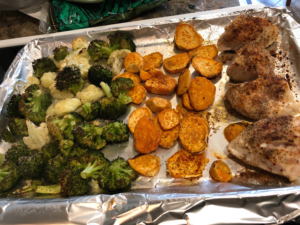 When cooking a sheet pan meal, I use the largest cookie sheet pan I own and divide it into three parts (protein, vegetables, and potatoes), but you can add any of your favorites! Once laid on the sheet pan I drizzle olive oil onto my potatoes and vegetables and season each section as desired. I tend to keep my seasoning simple with sea salt, pepper, garlic, cumin and oregano. Check out this sheet pan recipe that will be featured on the next Facebook Live episode coming up on 10/16/18 at 11am with Registered Dietitians Klara and Kaitlin! Looking for more recipes ideas and how-to meal plan for you and your family? Reach out to us at 301-474-2499 or at admin@rbitzer.com to set up an appointment with one of our Registered Dietitians! Contributions for this blog by Sam Maldonado, dietetic intern.